Diana Dyer, MS, RD: There and Back Again: A Celebration of National Dietitian's Day 2009! There and Back Again: A Celebration of National Dietitian's Day 2009! Welcome to my post celebrating the 2nd annual National Dietitian's Day on March 11, 2009, as a part of National Nutrition Month. You may also read my 2008 post, but please come back to read 2009! This year I am participating in a BlogFest with other Registered Dietitian (RD) bloggers, where we are all writing about what we do as RDs. All of their blog links are at the end of this post so you can sample a wide array of savory 'tastings', 21 blogs that showcase the wide variety of roles, responsibilities, and rewards of being a Registered Dietitian today! The advantage of a career in the field of nutrition and dietetics is the wide array of opportunities for you to find your passion. In other words, it is completely possible to love what you are doing for years and years and then segue (or even jump!) to another career under the wide umbrella of dietetics. I am the perfect example! 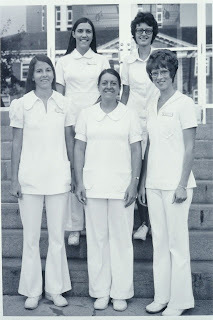 I trained back in the 1970's when a typical career for an RD was working in hospitals. Indeed, I spent the first 20 years of my career working as a clinical dietitian doing just that. I never worked on the food preparation and delivery part of that picture, but instead specialized in providing the nutritional care for critically ill patients who were typically in an ICU and needed highly technical nutrition through an IV or tube feeding directly into the stomach or small bowel. I loved my work. The specialized expertise I contributed to those patients' complex medical care helped them recover and was highly valued by the critical care medical teams at each hospital where I worked during the 70's, 80's, and 90's. I always found the work challenging, interesting, and meaningful (and uniforms for RDs are definitely a thing of the past, thank goodness). However, after my second breast cancer diagnosis in 1995, I could feel a "pull" or tug in my heart to do something of service within the cancer survivorship community. I didn't know what that could be or would be. Could I do something as a dietitian? I didn't have a clue (certainly not a 'business plan'), but I could not deny the depth and strength of what I was feeling, so after much self-reflection, I took a deep breath, a big leap, and left the position I loved in the ICU in 1996 at peace with my decision, still not knowing exactly what was coming next for me. I am not recommending "the leap" as the best route for everyone (especially in today's difficult economy), however, it was the best for me. It allowed me the time and space to evolve into my new role as a dietitian. 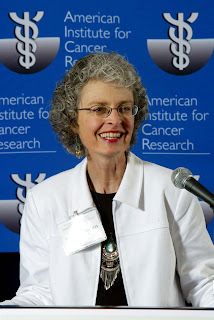 In a nutshell, after being almost "sequestered" in the ICU, I was now out in the real world with millions of other real people, millions being cancer survivors just like I was, many of whom were seeking answers to the same question that I was asking myself, i.e., "Now that my cancer therapy is completed, how can I help myself optimize the odds for my long-term cancer survival and an overall healthy life?" What foods should I be eating? What foods should I be avoiding? Should I eat only organic foods? Should I be taking vitamins or other supplements? What type of exercise, how much would be helpful? And so on and so on and so on! In one giant leap, I went from one end of the health care spectrum to the other, from critical care to prevention and wellness! With lots of help from colleagues, friends, even strangers, plus lots of my own focused passion and yes, even courage, I used all my expertise and skills as a Registered Dietitian to learn new information and acquire additional skills to begin a new career focused on providing "information and inspiration" for cancer survivors. mentored hundreds of other RDs as they also spread their wings into new career paths. As I read through this description of what I have been doing for the past 10+ years, I am more than a bit overwhelmed reflecting about the new information and skills I had to learn on this journey, all I have done with that information and those skills, what I have accomplished (still lots to do, of course), but most importantly, how being a Registered Dietitian was the key that opened so many doors for me to have these opportunities to help so many people. And today? Am I still doing all this? No, not really. I "semi-retired" in June 2007, although I am not sure what that really means. While I still do some (but much less) speaking, consulting, advising, professional writing, and mentoring, what I have added now that I really enjoy is blogging! I just love writing for this blog plus my new blog 365DaysofKale.blogspot.com. I know that I will always have a heart-felt connection to oncology in general and all other cancer survivors in particular, but I find myself coming back to an early passion (funny how that often happens in life!) when I was inspired by the first Earth Day to use my college degree in biology to become an environmental biologist. For a variety of reasons I didn't do that, going on to graduate school to study nutrition and become an RD instead. However, the thought keeps percolating through my mind that perhaps the very best way I can continue to serve the cancer survivorship community at this point is by enlarging my focus on cancer survivors to include the other end of the cancer spectrum, i.e., more wellness = more cancer prevention = fewer cancer survivors! How? By going back to my original passion for environmental biology (the relationship between human society and the earth's natural resources) and re-focusing on environmental nutrition (the relationship between sustainable ecosystems and maintaining optimal nutrition and well-being for all people). Our planet's multiple environments or ecosystems. In other words, our personal food choices not only profoundly impact our individual health (i.e., cancer prevention and survivorship plus overall health) but the environment and health of our planet, too. Yes, they are all connected. I am convinced that we need to back up several steps before "we what we eat" to embrace an understanding that we are also "what we grow" plus"how we grow" and raise our foods. There is plenty of room under the wide umbrella of the nutrition and dietetics profession for RDs who have a passion for connecting the dots between our food, our health, our environment (including climate change), and the sustainability of our planet's natural resources. In fact, RDs with these interests are urgently needed now more than ever in every area of dietetics practice. Thus one of the fastest growing Dietetic Practice Groups (DPGs) within The American Dietetic Association is the Hunger and Environmental Nutrition (HEN) DPG, whose vision is focused on promoting access to nutritious food and clean water from a secure and sustainable environment. In many ways, I feel as if I have both come home and found a new home within the HEN-DPG and its many passionate and dynamic members. Hire an RD as part of your professional staff, whether you are a cancer center administrator or wellness coordinator for a business as just two examples, where RDs will improve the health of your organization by helping to both cut health care costs and optimize the wellness of your patients or employees. I also hope you are inspired to read at least some of these additional RD blog posts at the end of this post. I'll just bet that they will help you act on at least one of the above three possibilities. I have every intention of doing just that and hope you will, too! • Cheryl Harris - Me, a Gluten Free RD! • Meal Makeover Moms' Kitchen - Family Nutrition ... It's our "Beat"
• Wendy Jo Petersen - March 11 is our day to shine! • Rebecca Scritchfield - Big Tips from a "Big Loser"
• Monika Woolsey - Dietitians--Can't Do PCOS Without Them! Hi. I came here from the link on Renata's blog Nurturing Notes. I like the tagline "You are what you grow". Happy National Registered Dietitian's Day! And congratulations on 31 years of sharing your insights and positive energy into the world of dietetics. My life and the lives of countless other people are enriched because of your beauty and inspiration. Thank you for participating, for recruiting others to participate...and most of all, for using your story as an inspiration instead of letting it be a barrier. You are definitely an inspiration to me. Thank you for taking what could have been the hardest time in your life and transforming it into encouraging and uplifting others. You are an inspiration! Thanks for helping to publicize the RD blogfest. What a fun and educational way to celebrate National Registered Dietitian Day! Thank you for sharing your inspirational story and celebrating the profession of Dietetics. I've just met you and am getting to know you better through both your blogs but must agree with the other commenters. With every post I read, I am both informed and inspired. I am so proud of you as a fellow RD, in fact, inspired by you. Be well and thank you for your continual valuable efforts! Very Nice. I luv it. plz keep on writing you are doing a really good job.